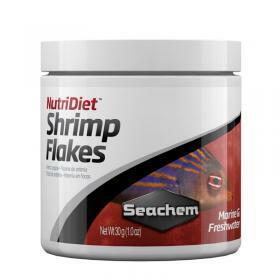 NutriDiet Shrimp Flakes: complete feed for ornamental fish. Balanced diet of high quality formulated to meet all the needs of marine and freshwater fish. It contains only superior quality ingredients including shrimp, fish and squid. Enriched with GarlicGuard (garlic) and chlorella to improve the health of the fish and its immune defenses. It also contains all the elements necessary and important to the diet of the fish: protein, fat, carbohydrates, vitamins and minerals. From one to three daily meals using only a small amount of feed equal to that which the fish consume in about three minutes. Nutritional additives: Vitamin A 40686 IU, Vitamin D 4703 IU, E6 Zinc 126.8 mg, 116.6 mg Iron E1, E5 Manganese 76.2 mg, 62.3 mg Copper E4, E8 Selenium 1.9 mg, iodine 1.4 mg E2, E3 cobalt 0.6 mg.